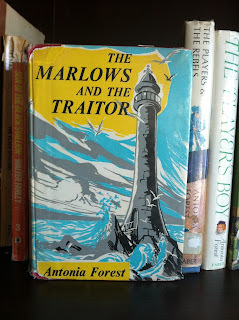 The next book in Antonia Forest's Marlow books, along with the third, works well in setting up the rest of the series after Autumn Term. The whole series occupies, in the real time of the characters, a two and a half year span. Autumn Term, when the twins are thirteen, gives us our first taste of Kingscote school and the girls' life; their relationships with various friends, staff, their sisters within the school context, and a sense of the separation between home and school. It is the Easter holidays and Nicola, with Lawrie, Ginty, brother Peter, and their mother, are spending it at a 'really lush, luxury hotel' by the sea while the drains of their London home are being taken up. Their father is involved with Navy exercises nearby, while their older brother is on his ship elsewhere, and their older sisters have gone to spend the holiday with various friends. Peter and Nicola, close in the way that individuals within a large family can find relationships in the midst of the communal ones, have lots of notes to compare about their respective terms at school - Peter having had a similarly difficult term to Nicola's first term at Kingscote with all its associated dramas. The book opens with Nicola and Peter heading out into a grey stormy morning, having both woken early. Despite having been warned about the treachery of the seafront during storms in this particular location, they decide to walk the sea wall that runs beneath an undercut cliff, and there is very nearly disaster when a huge surge nearly drags Nicola under the safety railing and out to sea. Still shaken, they head back, both dripping wet, realising they aren't going to be unnoticed, as there is a man heading towards them. Most disconcerted, Peter realises it is the officer from school who had berated him for incompetence in the 'boat thing' the previous term. Even more disconcerting, he acts as if he hasn't recognised Peter - although, Nicola insists that he did, "Like in The Thirty-nine Steps. The First Sea Lord. Don't you remember? The one who couldn't have known Hannay and did ... And his eyes flickered. So Foley's did too." When it all comes out at breakfast how very nearly they'd both been drowned, their mother is far from pleased. Peter feels as if, yet again, he's in the doghouse for being incompetent. Gently nursing him into a better frame of mind, Nicola agrees to a bus expedition to a place they've noticed on a signpost with the intriguing name of Farthing Fee. It's just a little village, but they find a mysterious path and follow it to a house called Mariners. It's clearly empty and in a moment of curiosity, they decide to explore, letting themselves in via the coal cellar and making their way up to a crow's nest. There is more mystery when they discover on a telescope mounted in the crow's nest a legend pointing to 'Foley's Folly Light'. Spooked they leave, but then the next day, despite Nicola having been warned off by a fisherman friend she's made that none of the rest of the family know about, return with Lawrie and Ginty. In a more thorough exploration of the house they come across some indications that someone has been occupying the cellars as there are blankets, and more disturbing, blueprints and microfilms. While they are discussing what to do, they are discovered - by Lieutenant Lewis Foley, Peter's nemesis from school. Clearly Foley has plans, and equally clearly, he's not about to divulge them. He locks Ginty and Peter into the cabin of The Talisman, but is forced to have Nicola with him in the cockpit due to her invariable sea-sickness. When he heads downstairs, leaving her with the tiller, fortified by a few shots of medicinal brandy forced on her by Foley, she seizes the opportunity to painstakingly turn the boat about to head back to St-Anne's-Byfleet. Half an hour later, Foley thunders up from the cabin, having realised, but it's too late - inspired by a ditty from her fisherman friend, Robert Anquetil (an old schoolmate of Foley's), she has dropped sugar into the petrol tank and the engine dies. Tide and weather drive them onto rocks and they end up at the Foley lighthouse, marooned when the boat breaks up overnight. Foley has to regroup and send a new message to his contacts, and the children realise very quickly that unless they do something, they may not survive this mad adventure. A covert bit of reconnaissance nets them the information that the lighthouse lamp is fully fueled. They hatch a plan to fake Peter drowning so he can hide upstairs while the girls act distraught and no longer a threat to lull Foley into a false sense of security, so that that night, they can send a message to the Navy fleet who are tantilisingly close for their exercises. It all comes right in the end, but not without many glitches for all concerned, including Nicola's friend Anquetil who has, it turns out, been monitoring Foley's movements. One of the truly remarkable aspects of this book is that, over some 250 pages, the real time period is only four days. Once Lawrie is separated from the others, the narrative separates into distinctly separate strands. To create tension, this is an excellent device because as readers, we are left with the same incomplete stories as the protagonists. Nicola's struggles with the dichotomy of half liking Foley while hating what he represents as a traitor are really interesting. Peter's bruised sense of betrayal for the same reason provide a wonderful counterpoint. Ginty's natural fragilities having betrayed her yet again in sequential moments of crisis, is left feeling grossly inadequate. Lawrie, on the other hand, having spent the bulk of the drama unconscious in hospital after being hit by a car after leaving the bus she caught back to the town, is, characteristically fully of herself and her broken leg! There is redemption for Peter. In the last stand at the lighthouse, when the U-boat has surfaced to take Foley off and the fog clears to reveal the British Navy standing by, he stands his ground when the German officer demands he come to the U-boat. He defends his sisters and, ever so gently, as he's been taught, squeezes rather than jerks the trigger of Foley's gun, which he'd seized when Ginty's one moment of clear thinking in a crisis resulted in Foley being pushed down the spiral staircase of the lighthouse, and disposes of the officer. Later, when it's all over, Commander Whittier, the highest ranking Naval officer in charge of the operation, asks Peter what it was that he'd said to the German officer before he shot. Peter though back. "I think I said: 'Get back to your ship.' Why? Shouldn't I have done?" But Whittier was grinning. "Certainly you should. One should always make the most of one's opportunities. But it'll be a long time before you strike one like that again. Know who he was?" "Well, I don't suppose his name would mean much. But during the war he was ein Kontenadmiral." The German syllables rolled grandly. "That's the equivalent of a Rear-Admiral. So just remember, when some haughty sub in your first ship is telling you what a low form of life you are, that you once gave a Rear-Admiral his marching orders." The pace, the complex net of tensions, the layers of politics - personal and beyond - and the brilliance of Forest's writing take this story of school children and a spy from something that could have been like a cliched Billy Bunter type of story to something rather different. The sequence of seeming coincidences, the incidental relationships that make up the interrelated net of personalities, and the failures and frustrations experienced by all the characters, are drawn from real life complexities and this makes it impressively realistic and probable. I had though, initially, and optimistically, to write about these books in clusters. I started my previous post about Autumn Term intending to combine it with this and the next book in the series. However, I find myself completely unable to do it! Just as well I have no brief to meet... These books demand more than a glance at the plot, and while I've not gone into detail, I hope I've managed to convey something of the magic of what it is that sees this whole series as one of my absolute treasures within my large collection of kid's lit.